It’s been a pleasure showing you Western Canada in Sunday Editions in June and July. This is the last week I’ll be your hostess for a while, and so I wanted to share our local scenery here in southeastern British Columbia. 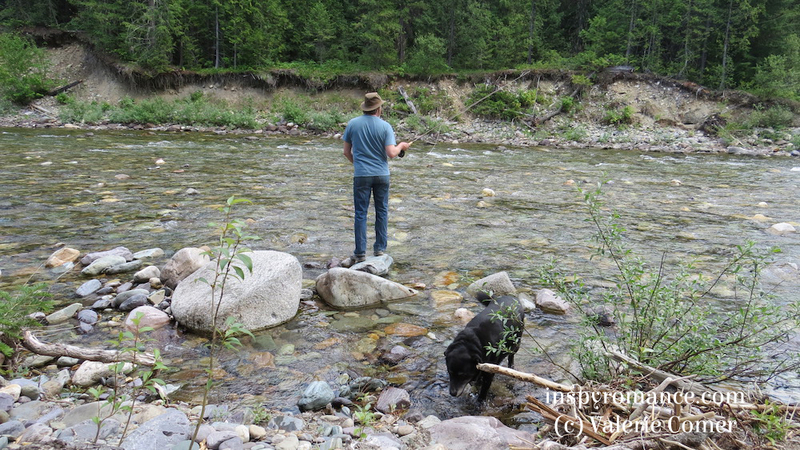 My husband and I, along with our ten-year-old Black Lab cross, Brody, spent a few days camping beside a mountain creek this past week. When I was a child drawing pictures, rocks were always gray. I’m not sure if there are more gray rocks in Manitoba (where I grew up) or whether I was simply blind to the colorful beauty, but now it seems I rarely see a gray rock. This is the view into the creek beside our campsite. Elizabeth Maddrey’s winner is Betty Robertson! Liwen Y Ho’s winner is thequeenofquitealot! Autumn Macarthur’s winner is MJSH! Hubby enjoyed some fishing, but (sadly) did not catch dinner. Valerie Comer’s Merry Kisses is 99c through July. Have a look at our new MENU at the top of the page. You’ll notice the NEWS tab has disappeared! Not to worry, we haven’t removed the information, just rearranged it into a more visual format. Now if you hover over the BOOKS tab, you’ll see four options: All Books (which is exactly the same as Books), Always Free, Audiobooks, and Author Newsletters. Have a look around and let us know what you think! On Monday, Jackie Castle announced that settings are characters, too! On Tuesday, Melanie D Snitker divulged her belief that it’s the little things! On Wednesday, Staci Stallings introduced us to a new #1 bestseller: If You Believe in Love. On Thursday, Marion Ueckermann posted a black blog… and #giveaway! 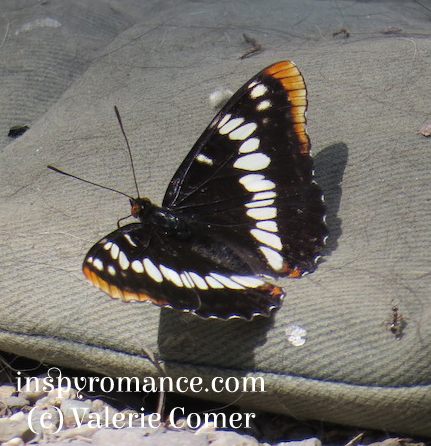 On Friday, Julie Arduini sharedAngelina and Dale’s real-life romance… and #giveaway! On Saturday, Cecelia Dowdy introduced us to An Hour Behind. Glad you got to camp before the campfire ban! Me, too! 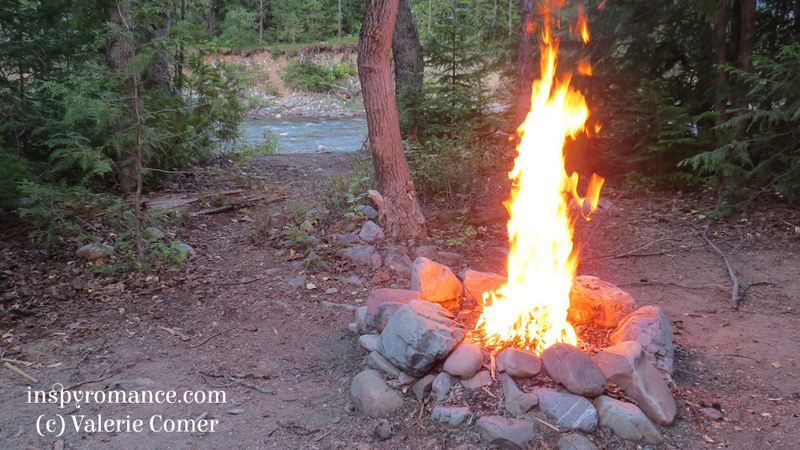 An evening fire has been such a ritual for our camping trips for decades, that it has seemed very strange to camp without one the past few years. Most years they are allowed early in the season, but as the weather heats and dries up, they are banned later in the summer, so we’ve learned how to do without (or stay home). Still, a campfire invites us to linger outside well into dusk rather than retreat into our trailer (used to be a tent LOL) and turn on our ereaders. Hi Valerie, I love that you and your husband make the time go camping:) Thanks for sharing your beautiful home state with us- one day, we will get over to Canada and explore it ourselves. We spent yesterday cross country skiing again- beautiful weather and good snow (in our short winter season we need to take advantage of the good days!!) We made it to the summit this trip, first time for the boys and they were so very excited- and tired driving home!! Both of us are introverted nature lovers. One of our best ways to recharge is to park beside a mountain creek for a couple of days. The trees and the running water soothe our souls. Thankfully our camping trailer makes it very easy compared to the extensive prepping when we tented. Move the contents of the fridge out, a basket of clothes, hook up, and on our way! I love to hear about your cross-country skiing adventures, too! Hi Valerie! Thanks for sharing your inspiring pictures of Western Canada and your beautiful province of British Columbia. During the summer I enjoy walking along Lake Michigan’s shores and collect a variety of stones – granite, quartz, limestone, sandstone, and shale. The variety is amazing. Best wishes. We keep bringing rocks home, too, and then we don’t know what to do with them! Do you display your collection? No. I get them for the grandkids to identify and do science experiment. The limestone reacts to vinegar and baking soda. Since this years Summer Reading theme was Libraries Rock – will paint some pet rocks. Also it makes me review the basics and keeps my mind active. Oh, how fun! What a great idea. Hey, Valerie! 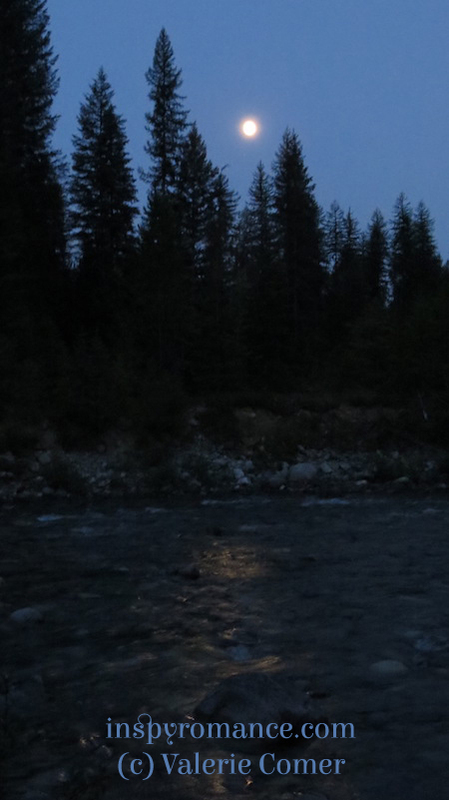 Simply love your photos, the creek, the rocks, the moon, absolutely beautiful! You will be missed here!! I’m glad you enjoyed the photos! 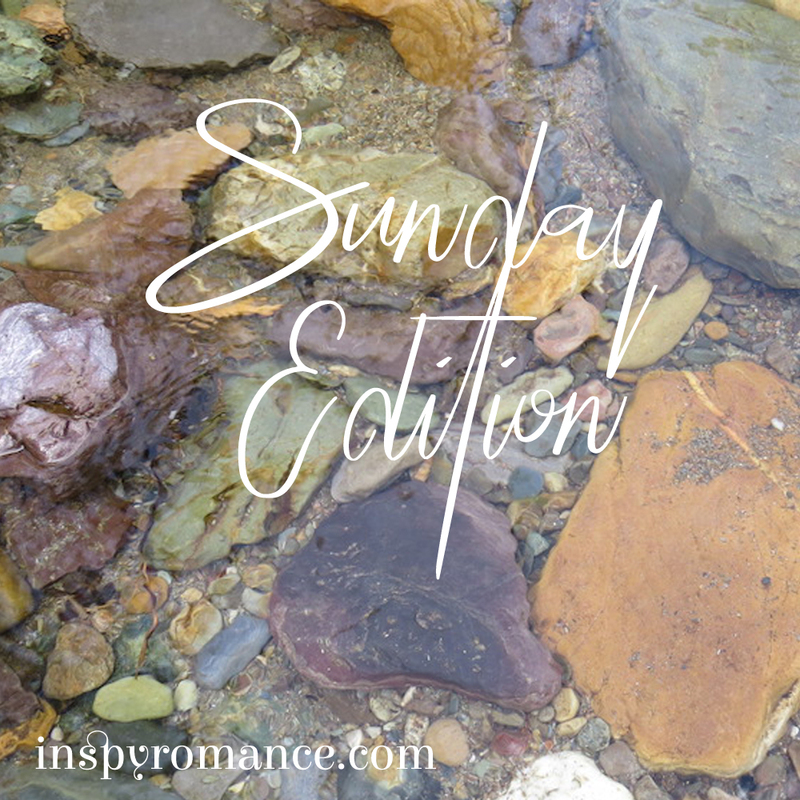 The Inspy Romance admin team trades off hosting Sunday Editions, so I’ll be back. Now I’m quite looking forward to catching up with Elizabeth’s temperature blanket she’s been crocheting this year! British Columbia, Alberta in fact all of our Canadian provinces are so beautiful. Thank you for sharing your pictures. Oooh, I see that “our!” What part of Canada do you live, Nina? I was born in Manitoba and have lived in BC most of my life. I’ve never been to Quebec or Atlantic Canada, but a trip like that is on my bucket list. Loved your pictures of BC. When my husband was living we visited often and many times taking along some grandkids. I am just south in Washington state and love Northern Idaho , BC nd our beautiful mountains. I am blessed to live in this part of the world. Also, very much enjoy your books. Thank you for sharing beautiful pictures, Valerie! I loved them! Thank you so much for sharing your trip to Canada. My husband and I have friends scattered all over Canada from one end to the other. We are looking forward to going back for a visit soon. As always I enjoyed your pictures. Beautiful countryside. God bless!